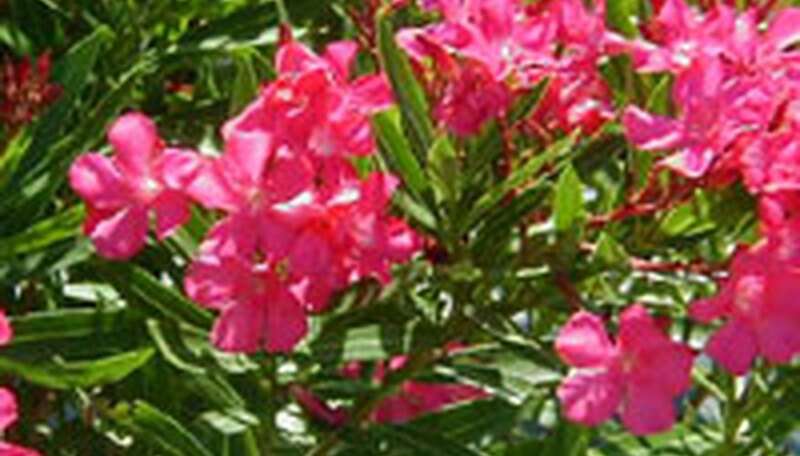 Oleander, or Nerium oleander, is an evergreen shrub and a perennial. It grows best in desert environments. They are hardy, require little maintenance and produce beautiful flowers. They don't need much water, and they can live in poor soil as long as there is a lot of sun. Oleander shrubs can grow as high as 20 feet! Usually, they are trimmed down to about 6 feet. The bright flowers are big and boisterous. The leaves are long and deep, jewel green in color. One important thing to note: they are highly toxic if eaten. To be safe, if you have children or pets, don't plant it. These colorful blooms can give off an intoxicating scent. The most important part of choosing a site is to be sure that it has full sun, or only a little shade. Plants in full sun will get bigger, brighter blooms. Try to find a spot where water drains well, although drainage is not terribly important. These hardy beauties will stand up and be noticed no matter what kind of soil they spring from. They can grow in sandy soil or salty soil, and they prefer dry soil. When you have chosen a site, dig a hole that is only as deep as the root ball and about twice the width. Before planting, inspect your root balls. The root mass should be balled up. If there are loose roots, your plants may not take as well. After you have placed the root ball in its hole, replace the lost soil. You can either use the original soil, or fill in with a potting soil (recommended). You can also buy seeds, but they are less likely to take and grow. If you want to use cuttings, plant in high summer. Water immediately after planting. Then, wait for the soil to dry out thoroughly before watering again. Although oleander requires little care while growing, proper care while planting will help growth rate. Water when the soil is dry. During droughts, water a couple of inches each week. Keep in the sun. But beware: while the soil doesn't need much water, the leaves and petals can dry out. Mist the leaves with water to avoid this, especially after a hot, sunny day. Don't mist during the afternoon, or the sun will burn the water off of them (and burn the leaves in the process). Mist early in the morning, before the sun comes out. If you want big, bushy oleander shrubs with lots of flowers, you'll need to prune your plants. Pruning oleander is easy. Look for a spot at the base of the plant where 3 leaves grow from the stem. Right above that is a little bump or node. Cut above the node. New branches will stem from the node, and each branch will have flowers. It's important to start pruning early. You don't want a bushier top half than bottom half, or the plant will fail to support itself. As with many plants, you need to pick the type that is best for your location. If you are looking for a smaller plant, go with the Petit Salmon variety, which only grows to 4 feet. White oleander is very popular,and one of the most popular types is Sister Agnes. A double-flowering yellow breed that is quite pretty is Luteum Plenum. To be sure the breed you want works in your locale, ask a local nursery. When buying oleander, make sure the tags specify the variety,not just the color. Oleander can be trained to grow as a border or even as a "fence" to hide eyesores on property edges.